Jaipur: Kolkata Knight Riders (KKR) openers Chris Lynn and Sunil Narine helped their team comfortably defeat Rajasthan Royals (RR) by eight wickets here at the Sawai Mansingh Stadium on Sunday. KKR have now moved up to the top position in the IPL points table with four wins and one loss, whereas RR continue to remain at the seventh position with a win and four losses. In a low-scoring encounter, Lynn and Narine slapped clueless Rajasthan bowlers with their 91-run partnership, which saw a rain of sixes. Rajasthan bowlers leaked 65 runs in the PowerPlay overs, which gave an upper hand to Kolkata in its 140 run-chase. Narine, who was dropped on 24 in the fourth over, was dismissed by leg-spinner Shreyas Gopal for 47. Just when it seemed RR would pull things back, Lynn quashed its hope, taking KKR to 100 runs under 10 overs. A lucky Lynn, who got a lifeline on 13 in the fourth over when Dhawal Kulkarni cleaned up but the bails did not fall, completed the job and got his fifty along the way just before Gopal got rid of him. Robin Uthappa (26*) and Shubman Gill (6*) finished the formality with their combined 26 runs and Kolkata bagged its biggest victory in this season with 37 balls remaining. Earlier, IPL debutant and Kolkata fast bowler Harry Gurney restricted Rajasthan to 139 for the loss of three, despite an unbeaten 59-ball 73 from Steve Smith. The host had a shaky start as they lost skipper Ajinkya Rahane cheaply for five, bringing in Smith. Kolkata maintained its full control on big hitters Smith and Jos Buttler, pressurising the host on 56 for the loss of one after 10 overs. Ending a 72-run partnership, Gurney got Buttler (37) caught at deep midwicket by Shubman Gill. In quick succession, the fast bowler struck Rahul Tripathi (6), who was taken by Piyush Chawla at mid-off. 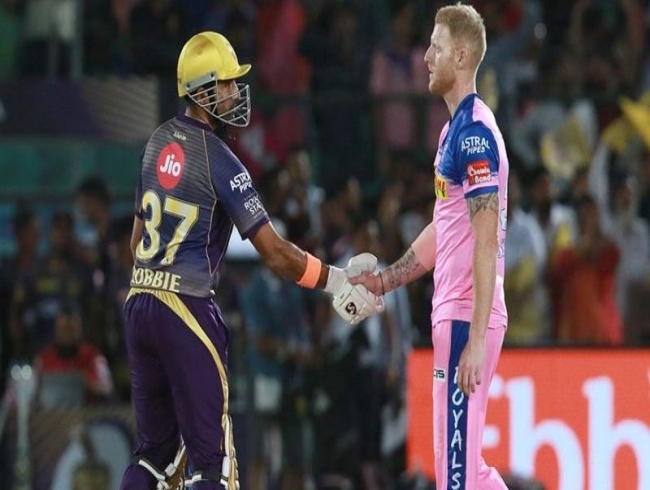 Ben Stokes came out to support Smith but Kolkata ensured the big guns get no opportunity to open their arms. Their 34-run stand just saw occasional boundaries from Smith, who completed his first T20 half-century since 2018. Smith and Stokes remained not-out on 73 and seven, respectively, giving their bowlers something to defend. Gurney returned with the figures of 2-25 on his debut. Chennai Super Kings will host Kolkata on April 9, before flying to play against Rajasthan on April 11. Brief scores: Kolkata Knight Riders 140/2 (CA Lynn 50, SP Narine 47, S Gopal 2-35) beat Rajasthan Royals 139/3 (SPD Smith 73*, JC Buttler 37, HF Gurnet 2-25) by eight wickets.